Do you end up buying the same foods when you go grocery shopping? Is your grocery cart full of healthy foods your kids won't eat or junk food you are ashamed they do eat? As you learn about healthy food and avoiding junk food, you can really put those lessons to work at the grocery store when you buy groceries. For example, comparing nutrition facts labels for Sunny D, a popular orange drink, would steer you towards buying the more nutritious SunnyD with Calcium or SunnyD Reduced Sugar. Or you might skip this orange drink altogether and go with calcium-fortified orange juice if you had time to compare their food labels. Unfortunately, parents are often in a rush at the grocery store and don't have time to compare food labels. 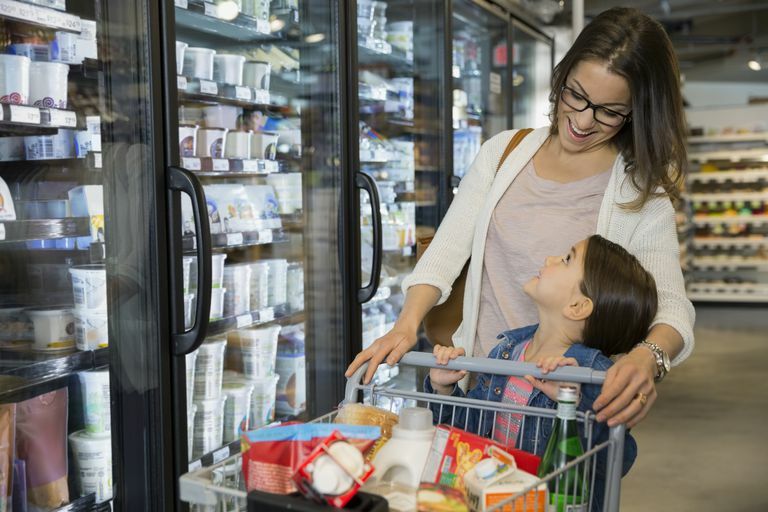 Since that is the best way to find healthy foods and even more nutritious versions of the foods you are already buying, you should consider making an extra trip to the grocery store without your kids when you have extra time to simply create your family's grocery list. Whole foods when possible, instead of processed snacks and foods that have a lot of extra sugar, ​fat (including trans fat), salt, and other things added to them and a lot of good things taken out, such as fiber. And of course, you want to buy foods that your kids will actually eat. Buying kid-friendly foods doesn't have to mean simply buying french fries and chicken nuggets, though. Reduced fat (2%), low-fat (1%), or fat-free (skim) milk - without chocolate or strawberry flavoring, which can add extra sugar and calories to your child's milk. Iron Kids Bread - a good option if your child is going to eat white bread since it has calcium, fiber, and extra iron. Fruits and Vegetables - choose a variety of fresh fruits and vegetables that are in season and that your kids enjoy, plus some pre-cut fruit and frozen vegetables that you can serve quickly. 100% Fruit Juice - you can buy a limited amount of 100% fruit juice, but avoid buying soda and fruit drinks. Keep in mind that unless the drink you buy says 100% juice on the label, then it likely isn't 100% juice, which leaves out many popular brands, including most types of Capri Sun, Hi-C, Kool-Aid, and Hawaiian Punch, etc. Minute Maid Kids+ or Tropicana Healthy Kids orange juice - in addition to vitamin C, folate, and potassium, these brands of orange juice have more calcium, vitamin A, B1, D, and E, than many other brands. Breakfast Cereal - avoid sweetened cereals and look for whole grain cereals with extra vitamins and minerals instead, such as Total, Multi-Grain Cheerios, Post Original Shredded Wheat Spoon Size, Kellogg's Frosted Mini-Wheats, or Total Raisin Bran, etc. Hot dogs - buy low-fat varieties, such as Oscar Mayer Light Beef Franks or Hebrew National Kosher Reduced Fat Beef Franks, fat-free hot dogs, chicken or turkey hot dogs, or even vegetarian hot dogs. Keep in mind that hot dogs can be high in salt and nitrates, so you might not want to let your kids eat them on a regular basis. Lean meats and poultry - including the leanest beef cuts, leanest pork choices, extra lean ground beef, skinless chicken parts, and boneless skinless chicken breasts and turkey cutlets. Luncheon meats - lean turkey, roast beef, ham, or low-fat luncheon meats. Canned light tuna fish, which is thought to have less mercury than albacore ('white') tuna. And remember because of current fish and mercury warnings, you should monitor and limit your younger child's fish consumption. Fat-free or low-fat salad dressings - which can also be used as a dip for fruits and vegetables. Just as important as the groceries you buy may be the groceries that you leave out of your shopping cart. Shark, swordfish, king mackerel, and tilefish - which are fish that have high levels of mercury and should not be eaten by young children. Shortening, butter, or stick margarine, which can be high in saturated fats and/or trans fats. Foods with added sugars, which can be identified by looking at the ingredient list for sugar, corn syrup, high-fructose corn syrup, molasses, etc. Snacks with a lot of calories from either sugar and/or fat, including potato chips, doughnuts, cookies, and candy. Most importantly, don't end up buying groceries that resemble fast food at home, such as prepackaged pizza, french fries, hot dogs, chicken nuggets, corndogs, and soda, etc.